Yesterday I shared an easy “layered’ brownie recipe with you from the back of the Glad holiday containers package, but Glad & M&M’S also asked me to come up with my own holiday recipe. The result is amazing, so much so that we packed these cookies right up in the Glad holiday containers and sent them home with my sister because we did not need them in the house after a week of Thanksgiving leftovers! In a medium bowl or stand mixer, cream together butter and sugar until light and fluffy. Add the eggs and vanilla and mix well. In a separate bowl, combine the flour, baking powder, and salt. Add the flour mixture and cocoa powder to the wet ingredients and mix. Stir in 2 cups of M&M’S. Use a cookie scoop or spoon to drop golf ball-sized balls of dough on a prepared cookie sheet or stone. Press a few M&M’S on top of each. Bake for 10-12 minutes, until the edges look cooked (although they’ll still be soft in the center). Cool on the cookie sheet for 5 minutes before transferring to a cooling rack. Find Glad holiday storage containers and White Chocolate Peppermint M&M’S available exclusively at Target this holiday season! 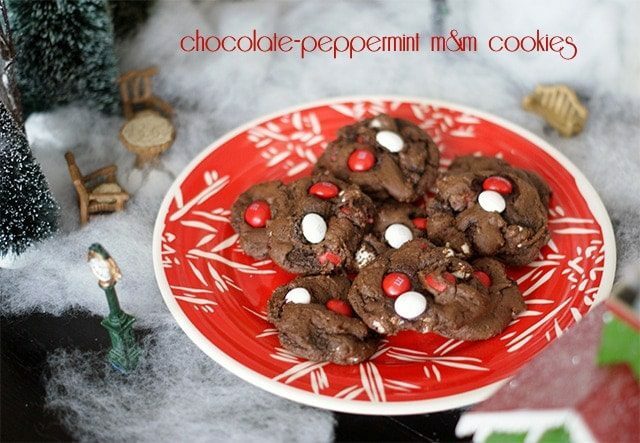 do you think it would work to add peppermint extract to the cookie dough itself? I have some peppermint extract I just bought, but have never used it before in recipes so I would have not idea how much to try adding. Hi Maria! I would try just 1/2 teaspoon or so if you won’t be using the peppermint M&Ms. With the M&Ms, I think it might be way too overpowering! Is there a better way to print off this recipe without printing off all the ads too? Wow, what a waste of printer ink and paper! Hi Genevieve – you can click on the Plan to Eat link under the recipe (http://www.plantoeat.com/recipes/3209944) and print it from there using their print-friendly format. I’m so sorry I made that last remark…I could have worded it different, me bad! Heard a sermon tonight and I’ve been thinking of what I said and how I said it and well, it sounds really angry…sorry! This dough is a little bit different than other cookies, but it should really be wet and sticky rather than sandlike, I think. How did they turn out when you baked them?